The remains of the Danish-born mother of Russia's last tsar are being taken to St Petersburg, 140 years after she first arrived in Russia. Empress Maria Feodorovna will be buried alongside her husband, Tsar Alexander III, as she had wished. 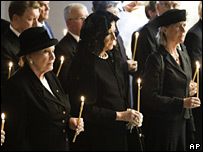 Her descendants joined Danish royals and officials for a memorial service at Roskilde Cathedral, west of Copenhagen. Born Princess Dagmar in 1847, she changed her name and converted to the Russian Orthodox faith on marriage. The tsarina had six children, including Russia's last Tsar, Nicholas II, who abdicated in 1917 during the Revolution. Months later he and his family were executed by Bolsheviks. There have been lengthy negotiations between Russia and Denmark on the terms of the transfer. Prince Dimitri Romanov, Alexander III's great nephew, has organised the return of the remains to Russia where Maria Feodorovna "lived the best years of her life." "It was our dream, my brother Nicholas and I, to grant the empress's wish and I feel great satisfaction and pleasure for our family to finally see our wish come true," he said. The coffin is being taken by Danish ship, to Russia. The coffin is due to be reburied on Thursday in the Peter and Paul Cathedral in St Petersburg.